Michael Mihm was born in Amboy, Illinois, on May 18, 1943. He graduated with honors from Loras College, Dubuque, Iowa, in 1964 with a Bachelor of Arts degree in Political Science. 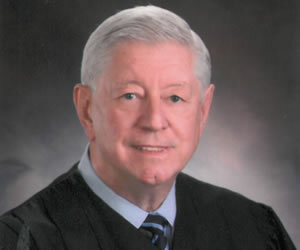 He received his Juris Doctor Degree from Saint Louis University School of Law in 1967. He served as an Assistant Prosecuting Attorney of St. Louis County, Missouri, and as an Assistant State’s Attorney of Peoria County, Illinois. He was elected State’s Attorney of Peoria County in 1972 and re-elected in 1976. In 1980, he entered private practice as a sole practitioner. In 1982 he was Nominated by President Ronald Reagan and Confirmed by the U.S. Senate to be United States District Judge for the Central District of Illinois. He was Chief Judge of that District from 1991 to 1998. He has been very active in the administrative processes of the federal judiciary, serving in several capacities on Committees of the U.S. Judicial Conference. In early 1994, Chief Justice Rehnquist named him to be the first Chair of the Committee on International Judicial Relations. He served as Chair of that Committee until October of 1995, when the Chief Justice named him to be a member of the Executive Committee of the U.S. Judicial Conference. In 1997 the Chief Justice renamed him to membership on the Committee on International Judicial Relations. He served on that Committee until October 2002. He has lectured extensively to other American federal judges from around the country at a number of judicial workshops and judicial retreats on a variety of topics, such as case management, and the role of the judge in society. Judge Mihm has hosted, lectured to and interacted with judges from over 45 countries from all over the world. The main topics of his lectures have been judicial independence, separation of powers, judicial ethics and integrity, and the development of an effective structure of court administration. He has traveled for Rule of Law events to Poland, Kyrghyzstan, Kazakhstan, the Russian Federation, China, and Mexico. From early 2001 to December 2006 Judge Mihm and Judge Paul Magnuson (Dist. Minn.) were the primary contacts of the American federal judiciary to the Library of Congress Open World Program, which has brought over 1,000 Russian judges to the United States to see first hand how our judiciary operates. Served for 6 years by appointment of the Chief Justice on the Supreme Court Judicial Fellows Commission. He was an Adjunct Professor of Law at John Marshall Law School in Chicago, Illinois, teaching courses there in “Accelerated Trial Advocacy” from 1991 to 2012. On August 6, 2004, he was the recipient of the USAID Outstanding Citizen Achievement Award for his Rule of Law work in Russia. He has traveled to Russia 19 times for rule of law programming. Since 2009, he has been a member of the Board of Directors of the U.S. Russia Foundation, and chair of its Rule of Law Committee. He is a member of the National Committee on U.S. – China Relations. In 2015, he was named to Irish Legal 100 list of distinguished lawyers in America.